Ruth Weber was the original Michaela in the world premiere of Georg Friedrich Haas‘ acclaimed opera Koma during the Schwetzinger SWR Festspiele 2016. The soprano appears anew as Michaela in the world premiere of the Klagenfurt-Version, which premieres on 28. March. Immo Karamann is the director and Bas Wiegers is the conductor. American tenor Joshua Stewart is the tenor soloist in Beethovens 9. Sinfonie at the Symphony Hall in Birmingham on 28. March. The concert with the City of Birmingham Symphony Orchestra is under the musical direction of Sir Simon Rattle. The Konzert Theater Bern premieres Philippe Boesmans‘ rare opera Reigen this month, opening on 31. March. Tenor Uwe Stickert sings the role of the Dichter under the musical direction of Chefdirigent Kevin John Edusei. The director is Markus Bothe. Julia Dawson is Mizi in Damiano Michieletto’s new production of Schreker’s Der ferne Klang, premiering on 31. March at the Oper Frankfurt. GMD Sebastian Weigle conducts. The Staatsoper Hannover premieres Schreker’s Die Gezeichneten on 6. April with baritone Brian Davis as Tamare. Mark Rohde conducts the Niedersächsisches Staatsorchester and the director is Johannes von Matuschka. The Staatstheater Braunschweig presents Dirk Schmeding‘s new production of Weinberg‘s opera Die Passagierin beginning on 6. April. Lithuanian mezzo-soprano Milda Tubelyté sings the role of Krystina under the musical direction of Christopher Lichtenstein. Hansung Yoo is Figaro in the revival of Il barbiere di Siviglia on 6. April at the Staatstheater Kassel. Mario Hartmuth conducts. Yannick-Muriel Noah gives her debut as Emilia Marty in the premiere of Die Sache Makropulos on 7. April in the Oper Bonn. Hermes Helfricht is the conductor and Christopher Alden the director. Susanne Braunsteffer takes over the role of Amelia in Un ballo in maschera on the 12. of April at the Theater Bremen under the musical direction of Marco Comin. Romina Boscolo is Ulrica. The Aalto-Musiktheater Essen revives its production of Tosca on 13. 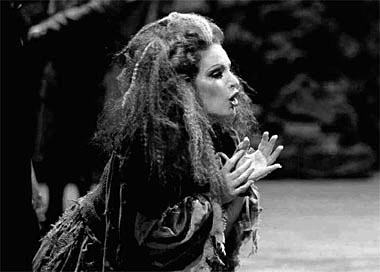 April with Dutch soprano Gabrielle Mouhlen in the title role. Robert Jindra conducts. Italian alto Romina Boscolo sings Suzuki in Madama Butterfly on 13. and 28. April at the Hessisches Staatstheater Wiesbaden. Christina Domnick is the conductor. The Philharmonisches Staatsorchester Mainz dedicates its Family Concert “Oper vorgestellt” on 16. April to Humperdinck‘s Hänsel und Gretel. American mezzo-soprano Jennifer Panara sings Hänsel under the musical direction of GMD Hermann Bäumer. Further performances are on 17. April and 4. May. Brasilian soprano Cristina Piccardi appears as Clorinda in the concert performances of Monteverdi’s Combattimento di Tancredi e Clorinda on 18. and 20. April at the Theater Hagen. Andrey Doynikov conducts the performances. Elizabeth Reiter and Irina Simmes are the Valkyries Ortlinde and Gerhilde in the revival of Die Walküre at the Oper Frankfurt on 21. April. The musical direction is in the hands of GMD Sebastian Weigle. Korean soprano Narea Son sings the role of Giannetta in the revival of L’elisir d’amore on 23. April at the Staatsoper Hamburg. Nicolas André is the musical director. Albrecht Kludszuweit is the tenor soloist in Orff’s Carmina Burana on 25. and 26. April in the Essener Philharmonie. Ivor Bolton conducts the 9. Symphonie Concert of the Essener Philharmoniker. The Staatstheater Darmstadt presents a double-evening of Der Bürger als Edelmann and Ariadne auf Naxos beginning on 26. April. American tenor Michael Pegher is Brighella under the musical direction of Hartmut Keil. Christian Weise is the director. Khatuna Mikaberidze sings Jokaste in the concert performances of Strawinsky’s Oedipus Rex at the Staatsoper Hannover. The premiere takes place on 27. April under the musical direction of Valtteri Rauhalammi.